The GREASOMATIC® is a programmable electrochemical automatic lubricator which expels it’s 120cc’s of lubricant in a controlled continuous flow for a preselected period from one month to twelve months. A patented adjustable galvanic element combined with a liquid electrolyte generates hydrogen gas which expands in a hermetically sealed chamber, forcing a piston to eject lubricant into the bearing. The translucent windows on the body of the unit allow the lubricant level to be monitored. It is recommended to monitor the lubricant level regularly to determine if the discharge setting is correct. The GREASOMATIC® contains a mildly acidic organic liquid electrolyte contained in a hermetically sealed flexible rubber expansion chamber. A patented adjustable zinc/molybdenum galvanic element is integrated with the control knob on the top of the unit, which when introduced into the electrolyte will produce gas. Rotating the control knob on the top of the unit adjusts the protrusion of a rod shaped electrode in the galvanic element. The amount of area the rod is exposed will determine the rate of discharge of the GREASOMATIC®. Pressing the red button releases the galvanic element from the control knob and turning the knob 10 to 12 times causes the element to drop into the electrolyte. 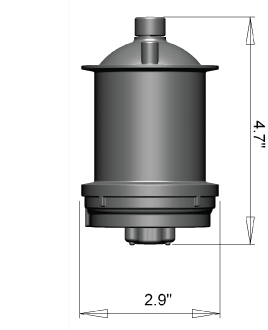 The GREASOMATIC® utilizes a control knob on the top of the unit to choose the discharge rate of the lubricant. Settings of 1, 2, 3, 4, 6, 8 or 12 months ejection periods are available (these periods apply at an ambient temperature of about +68°F and will be affected by abnormally high or low temperatures—(see Average Ambient Temperature Chart). If immediate output pressure is needed, activate the GREASOMATIC® in advance, approximately 24 hours per month setting. Turn the control knob clockwise so the arrow is pointing to the desired monthly setting. If you turn the control knob to far and pass your de-sired setting, you can turn the knob counterclockwise back to zero and start again. Press the red button until it is flush with the top surface. Once the red button is pressed the discharge rate can not be changed. Rotate the black control knob clockwise 10 to 12 turns. This releases the galvanic element into the liquid electrolyte, thus activating the GREASOMATIC®. The normal discharge durations of 1, 2, 3, 4, 6, 8 or 12 months apply at an ambient temperature of 68°F (+20°C). Output and discharge durations will vary if the GREASOMATIC operates at a higher or lower temperature. The table below illustrates the output and discharge durations at varied temperatures. On first installation, use a hand grease gun and the same type of lubricant to pre-charge all fittings, lines and the bearing. The thread of the GREASOMATIC® is 1/4 BSPT and can be adapted for other thread sizes using standard adapters. The GREASOMATIC® can be mounted direct or remotely up to 6 feet from the bearing when filled with a NLGI #1 or #2 grease. Longer remote lines (up to 15 feet) can be achieved when filled with lighter greases or oil. When remote installation is required we recommend at least 6mm ID tubing. GREASOMATIC® lubricators filled with grease work in any position, and can be used indoors, outdoors, and under water. A GREASOMATIC® filled with oil. Install the unit with the outlet in the up position and using a remote line to the bearing. Install a check valve on the outlet of the GREASOMATIC® to prevent the oil from running out. Normally a GREASOMATIC® operates at a pressure of 15 psi (1 bar) with a max working pressure of 72psi (5 bar). In the event of a blockage in the bearing, the GREASOMATIC® will build up to an internal pressure of about 87 psi (6 bar) at which time the pressure relief valve will open and release lubricant from the base of the unit. This condition indicates there is a blockage and the bearing is not being lubricated. Clear the blockage in the bearing and install a new GREASOMATIC to the lube point.